What is Second Harvest Food Bank? Second Harvest Food Bank is the East Tennessee region’s largest hunger-relief charity; operating programs in 18 counties. The food bank secures and distributes over 16 million pounds of food and grocery products annually through a network of over 500 partnering non-profit organizations such as food pantries, soup kitchens, emergency shelters and schools. Why is it needed? 1 in 6 people in East Tennessee lives in poverty and has difficulty meeting basic needs. Among children in our community, 1 in 5 is at risk of going hungry today. The need among senior citizens continues to rise. In our East Tennessee community, an astounding 200,000 people are at-risk of hunger. How do you get food to the people who need it? We work hard to build a partnership with any group that is committed to hunger-relief. Often, this is with other non-profit organizations that operate a local community feeding program or with locations like schools that agree to distribute food for consumption off-site. When these organizations are not available, Second Harvest delivers food directly to clients. Our programs are arranged to reach every demographic in every corner of East Tennessee. For a list of programs click here. Who are partnering agencies that receive food from Second Harvest? Partnering Agencies are non-profit organizations dedicated to feeding the hungry and include church pantries, shelters, group homes, soup kitchens, community centers, schools, rehabilitation clinics and many others. Second Harvest acts as a distribution and food-resource center for these organizations, saving them time and money and allowing them to concentrate on their core mission. Organizations like FISH, the Salvation Army, Open Arms, Western Heights, New Life, Community Food Connection, Appalachian Outreach, VMC and hundreds of other non-profits like shelters, pantries, senior center and schools depend on us in order to feed the hungry. On average, more than 75% of all food distributed by a church or a community pantry in East TN, comes from us. Where does the food come from? About 35% of our product is purchased at the request of non-profit organizations we serve. Items are purchased at bulk rate and at brokered discounts.The majority of food comes from donations of fresh, canned, prepared and packaged items by local grocers, restaurants, manufacturers, distributors and through food drives. This food is often time-sensitive, damaged or seasonal. All donated product must be inspected and often reworked or repackaged. The majority of donated items are delivered directly to other nonprofits, for free, through various programs. Shelf-stable product that requires re-work and storage is available for non-profit partners at a rate of 1 to 19 cents per pound. Thats a typical savings of $1.47 per pound versus retail. How efficient is Second Harvest? Second Harvest is audited annually and spends 2% of our budget on administrative expenses, 4% on fundraising and 94% on operating our hunger-relief programs. We can provide 3 nutritious meals with every $1 donation. Charity Navigator confirms that 94% of funds are spent on programs. For additional third party evaluation check out GuideStar. Click here to view the latest Annual Report. Additional Information Second Harvest Food Bank of East Tennessee is part of a national network of foodbanks called Feeding America. Feeding America members cover every county in America. Second Harvest of East Tennessee serves 18 counties in East Tennessee, delivering food as far west as Crossville and as far East as Newport. Almost two-thirds of American seniors living with Alzheimer’s are women. Of the 5 million people age 65 and older with Alzheimer’s in the United States, 3.2 million are women and 1.8 million are men. The number of Americans with Alzheimer’s disease and other dementias will escalate rapidly in coming years as the baby boom generation ages. By 2050, the number of people age 65 and older with Alzheimer’s disease may nearly triple, from 5 million to as many as 16 million, barring the development of medical breakthroughs to prevent, slow or stop the disease. Nearly one in every five dollars spent by Medicare is on people with Alzheimer’s or another dementia. The average per-person Medicare spending for those with Alzheimer’s and other dementias is three times higher than for those without these conditions. The average per-person Medicaid spending for seniors with Alzheimer’s and other dementias is 19 times higher than average per-person Medicaid spending for all other seniors. The financial toll of Alzheimer’s on families rivals the costs to Medicaid. Total Medicaid spending for people with Alzheimer’s disease is $37 billion and out-of-pocket spending for individuals with Alzheimer’s and other dementias is estimated at $36 billion. Women are at the epicenter of the Alzheimer’s crisis. A woman’s estimated lifetime risk of developing Alzheimer’s at age 65 is 1 in 6, compared with nearly 1 in 11 for a man. As real a concern as breast cancer is to women’s health, women in their 60s are about twice as likely to develop Alzheimer’s during the rest of their lives as they are to develop breast cancer. Not only are women more likely to have Alzheimer’s, they are also more likely to be caregivers of those with Alzheimer’s. More than 3 in 5 unpaid Alzheimer’s caregivers are women – and there are 2.5 more women than men who provide 24-hour care for someone with Alzheimer’s. Because of caregiving duties, women are likely to experience adverse consequences in the workplace. Nearly 19 percent of women Alzheimer’s caregivers had to quit work either to become a caregiver or because their caregiving duties became too burdensome. *The Alzheimer’s Association 2014 Alzheimer’s Disease Facts and Figures includes a special report on women and Alzheimer’s. Inspired by compelling findings published in The Shriver Report in 2010, the Alzheimer’s Association conducted a follow-up poll in 2014 to continue exploring how Alzheimer’s disease affects American women. Alzheimer’s is the most common form of dementia, a general term for memory loss and other intellectual abilities serious enough to interfere with daily life. Alzheimer’s disease accounts for 50 to 80 percent of dementia cases. Learn more: What We Know Today and Understanding Dementia. Alzheimer’s worsens over time. Alzheimer’s is a progressive disease, where dementia symptoms gradually worsen over a number of years. In its early stages, memory loss is mild, but with late-stage Alzheimer’s, individuals lose the ability to carry on a conversation and respond to their environment. Alzheimer’s is the sixth leading cause of death in the United States. Those with Alzheimer’s live an average of eight years after their symptoms become noticeable to others, but survival can range from four to 20 years, depending on age and other health conditions. Learn more: 10 Warning Signs and Stages of Alzheimer’s Disease. Alzheimer’s has no current cure, but treatments for symptoms are available and research continues. Although current Alzheimer’s treatments cannot stop Alzheimer’s from progressing, they can temporarily slow the worsening of dementia symptoms and improve quality of life for those with Alzheimer’s and their caregivers. Today, there is a worldwide effort under way to find better ways to treat the disease, delay its onset, and prevent it from developing. Learn more: Standard Treatments, Treatment Horizon, Prevention and Clinical Trials. For the last 10 years or so, it has become my daily habit to spend 15-20 minutes in my hot tub right before I go to bed at night. This time is spent relaxing/unwinding as well as thinking about the day past and the day to come. It is also in my nature to spend some of that time observing the night sky. I regularly see jets and satellites traveling high up in the sky and, since Central Vermont Medical Center is visible from my house, I frequently get the chance to see the medivac helicopter coming and going in the night. When the time is right, at various times of the year, I have also get a ringside seat for some pretty spectacular meteor showers. Last night, however, I had an amazing showing of something that I had both heard of and read about, but never seen… an Iridium Flare! An iridium flare is caused by the reflection of the sun’s light off of one of the 88 Iridium Satellite LLC’s communication satellites, which are orbiting approximately 485 miles above the earth’s surface. These satellites are a part of a global communication network that allows mobile and pager usage anywhere on earth; including both poles. 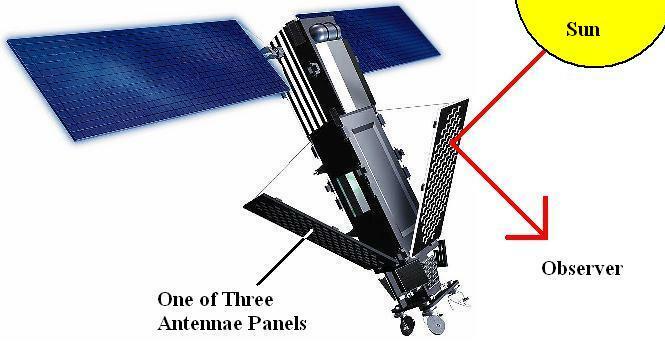 The satellites are arrayed such that at least one of them is constantly providing overlapping coverage for every inch of the earth’s surface and there are several of them that pass over the central Vermont region. Each of these satellites has 3 highly-polished, silver-coated teflon antennae which provide mirror-like reflectors for sunlight. When one of these satellites passes over your location, there is a small chance that it will be oriented in such a way as to send that reflected sunlight to you. While these satellites are passing over your location 24 hours a day, the reflections that they produce are, under normal circumstances, only visible at night. The reflected sunlight from these satellites is very bright; the brightest measuring in the range of -4.0 to -8.5, using the same scale of magnitude used to measure the apparent brightness of stars. For your reference, the brightest star visible in my night sky is Sirius (part of the Canis Major constellation… look slightly “southeast” of the easily recognizable Orion’s Belt) at only a magnitude of -1.46, the brightest planet is Venus with an apparent magnitude of -4.6 and the full moon on a clear night shines with a magnitude of about -12. You can easily tell that these flares, when visible, can definitely be one of the brightest visible objects in the night sky! These flares, however and unfortunately, last only a short amount of time… approximately 30 seconds… and are visible in only a very narrow region… only about 10km wide on the earth’s surface… so your chances of simply looking into the night sky and seeing one of these flares is pretty slim (though it worked out well for me!). Fortunately there are Websites and smartphone apps that make it pretty easy to determine an optimal time for taking in one of these flares. For Websites I would recommend HeavensAbove.com. Once you enter your location information… this can be done by either browsing using a map or, if you already know it, manually inputting the Latitude/Longitude of your current location. The “Iridium Flares” page will then show you the visible Iridium flare for the next week (at night) at your location. For smartphone apps (I looked at many and I use Android), my favorite of the moment is called ISS Detector, which is available for free from the Google Play store. In addition to providing information about the ISS (International Space Station), which is also visible in the night sky, you can get viewing information for Iridium flares as well many other bright man-made objects in the sky. One of the best features offered by this app is the fact that it takes the weather for your location into account when highlighting upcoming viewing opportunities… a cloudy sky means no visibility, of course… thus maximizing the chance of you seeing one of these relatively rare events. My first Iridium Flare viewing happened by chance, but that is certainly not the way that my next viewing will take place. From my hot tub I have an unobstructed view of only about 30% of the night’s sky, but using the Websites or smartphone apps, it should be easily possible to determine when my next opportunity will take place… and I am looking forward to it!